When we last checked in on Armageddon Energy, the prefab solar panel startup had completed panel prototypes and was working on a beta funding round. Now, nearly a year later, Armageddon has teamed up with electronic component manufacturer Tyco Electronics to speed up the release of Armageddon’s SolarClover system, which is scheduled to go on sale later this year. A single 400-watt SolarClover features three 10- to 12-pound silicon hexagonal panels, a triangular frame and a micro-inverter. 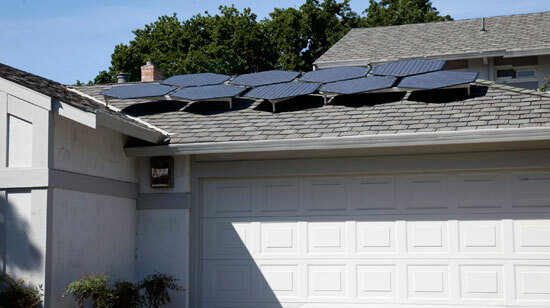 Armageddon claims that even a larger 1 kW system can be installed by non-specialists–a group that includes roofers, electricians, general contractors, and maybe even your handy neighbor–and can offset the power usage from all major household appliances. By cutting out the middleman (solar installers), Armageddon increases the efficiency and potentially lowers the cost of installing rooftop panels. No word yet on how much a single SolarClover will cost, but Armageddon claims it will be comparable to a traditional rooftop solar system.